Sinatra: RAW, despite being in the first-person narrative, is a finely balanced insight into the life and times of Frank Sinatra (1915-1998) (Richard Shelton). The audience is treated to many of Sinatra’s standards – even if I thoroughly disagree with the notion that any lady who “loves the theatre” could possibly be a tramp – and there’s a lot of storytelling to go along with the music. Perhaps the cabaret setting for this pre-Edinburgh Festival London performance may have reflected the Purple Room in Palm Springs in 1971 – a venue that still operates today. I wasn’t clock-watching, but I would estimate that roughly the same amount of time was given over to songs as to the spoken word, and some of the stories are fairly detailed. 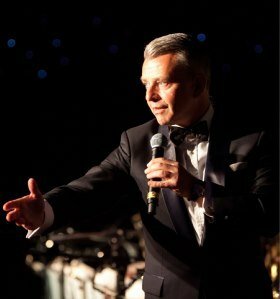 There are Rat Pack tribute shows, most notably the one that has enjoyed several seasonal runs in the West End in recent years. But this one, aside from having Sinatra and Sinatra alone, without Sammy Davis Jr and Dean Martin (and others), goes deeper than the light-hearted public and jovial façade that is put on for those productions. There are punchlines and amusing stories, but there are also some deeply reflective and poignant tales. Other stories deal with trouble and turmoil, and it is not always easy to sympathise with Sinatra. An example: President John F Kennedy had, apparently, snubbed Sinatra, despite all the singer had done to assist with the election campaign for the Democratic Party candidate. Kennedy stayed with Bing Crosby when he came to Palm Springs instead of staying with Sinatra, a slightly bizarre decision given Crosby’s support of the Republican Party. Sinatra was furious, maybe with some justification, but frankly, he should have known better: Kennedy wasn’t the first politician to have odd ways of thanking their supporters, and as you know, he wasn’t the last. Politics continued to feature in the anecdotes shared with the audience. Some still hold much resonance today. In particular, he championed the cause of equality for black performers, and even before the Civil Rights Act 1964 came along, he was distinctly uncomfortable with fellow singers and entertainers being forced to go through separate entrances and exits simply because they were not white. I wonder what Sinatra would make of the Black Lives Matter campaign. There are stories of the personal kind as well as the professional kind – a lengthy description of Ava Gardner (1992-1990) and the relationship Sinatra had with her was interesting to listen to, especially for those who, like me, possess a working knowledge of the more renowned Sinatra songs but not a lot about his love life. The production is, therefore, an educational experience as well as an entertaining one – and Shelton sings Sinatra’s back catalogue brilliantly. Such an easy-going rapport with the audience is very welcoming, and the banter kept tasteful if a tad frisky on occasion. I loved the genial manner in which minor disturbances were swiftly dealt with, as well as the friendly direct dialogue with the audience (not, I hasten to add, the same as ‘audience participation’). In capturing the highs and lows of Sinatra’s career, and there were plenty of both, this production is a glorious and compelling masterpiece. I wish it every success at the Edinburgh Fringe, and hope it won’t be facing its final curtain any time soon. YOU ARE INVITED… 1971 – Palm Springs, The Purple Room.